From briefcase to paintbrush, life for artist Roland Miguel wasn’t always clear. Like most, he spent his younger years navigating the ins and outs of what the world had to offer him: the good, the bad, and everything else in between. During the July First Friday Gallery Walk, the Paseo Art Association’s annual juried printmaking exhibition, Print on Paseo, had its opening reception in the Paseo Art Space. 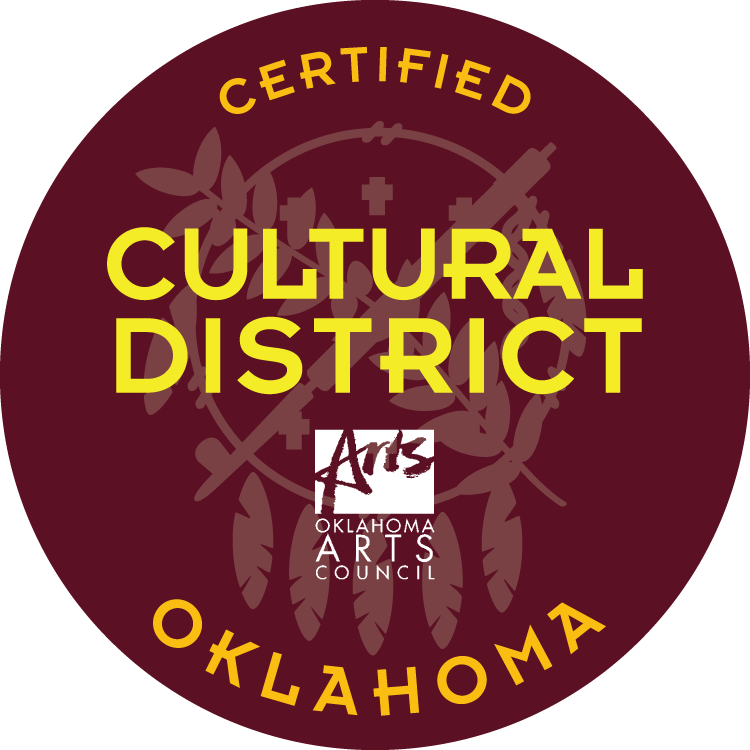 Through this exhibition, the Paseo Arts Association strives to represent and spotlight the depth and diversity of Oklahoma printmakers. Prints are created from a single original surface, known as a matrix or plate. Plates can be made from a variety of materials and the methods of printmaking are diverse. Most methods are represented in this year’s show, but two specific pieces standout. One artist created their print with a fish, and the other used their very own face. Kafie Carman’s piece School of Gyotaku utilizes an ancient method called Gyotaku, which dates back to the mid-1800s. It began, not as an art form, but as a way for Japanese fishermen to keep a record of their catches. For Carman, Gyotaku gave her an opportunity for her to combine her hobby of fishing with her love for art. According to Carman, the title of her print references both the subject matter, a school of fish, and how she’s still being “schooled” by her group of artist friends, whom she meets and creates with biweekly. Like Carman, Emily Hoebing used an existing object to create her print Skins 1.25 rather than make a new plate - her face. Hoebing didn’t originally plan to use her face for printmaking, but after a few months of saving her makeup wipes, she knew she had to create something with it. Hoebing says the “1” in the title of her piece represents her face, while the “.25” refers to the 25 different “faces” displayed in the print. She hopes this print will be the first in an anthology that she will add to in the future. Both Carman’s School of Gyotaku and Hoebing’s Skins 1.25 will be on display until July 28 in the Paseo Art Space Tuesday-Saturday 12-5pm. These prints, along with the other Print of Paseo prints are all available for purchase. Catch Jim's show, Hidden Treasures: Seeing into the Unseen in the Paseo Art Space through the month of April, with an opening reception during the First Friday Gallery Walk on April 6! Throughout the month of March, the Paseo Art Space will feature original works by artist Alicia Saltina Marie Clark in her show titled Fragmentary Stories. A proud member of the Caddo Nation, Alicia works to preserve her unique personal history through art. Alicia received a laundry list of accolades for her art in high school and college, but chose to take the path less trodden after college graduation. For five years, Alicia traveled across North America, met people with alternative lifestyles and learned to live primitively, picking up on how to tan hides, create bone jewelry, spin wool, light a fire, dye natural fibers with plants and identify which wild plants were edible. After this adventure, Alicia returned to Oklahoma to pursue her calling as an artist, which she has embraced since she was a young child. Meet artist Jim Weaver and his best friend, Annie! Our final PAA Member Spotlight for the month of February goes to Jim, who has been exhibiting his unique pieces in Paseo art shows since 2014. When he is not busy teaching Annie how to drive, Jim creates works on tooled leather that express environmental and social themes. This week’s Member Spotlight goes to artist Bryan Dahlvang! When asked what he loved most about the Paseo, Bryan said it had to be the “unique, inspirational zone of creativity” one can find every month with such a wide variety of art and artists. Whether he's painting, drawing or mixing things up with found objects like sticks, bones and orange peels, his work is distinct and unique. No wonder he has been exhibiting his evocative pieces in Paseo art shows since 2006!